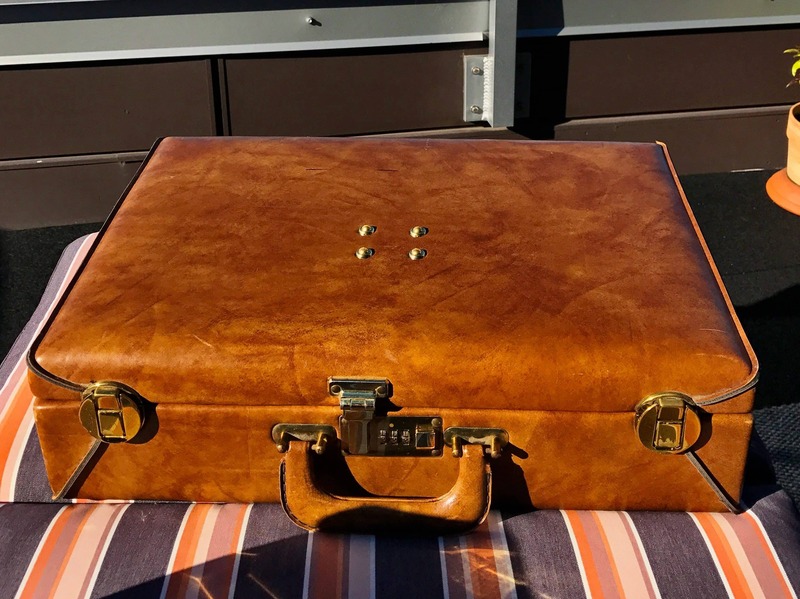 I get a lot of comments and questions about my DJ rig, which is encased in a small vintage briefcase. The software that makes it possible is a fantastic DJ application for iOS called DJ Player Pro (DJPP). DJPP works on all iOS devices, even older iPads. It allows me to layer 4 tracks together at a time. It interfaces with any class-compliant USB audio card and is fully MIDI programmable, so I can configure it to work with just about any standard DJ mixer. I have created my own custom MIDI mapping to work with the mixer I use. 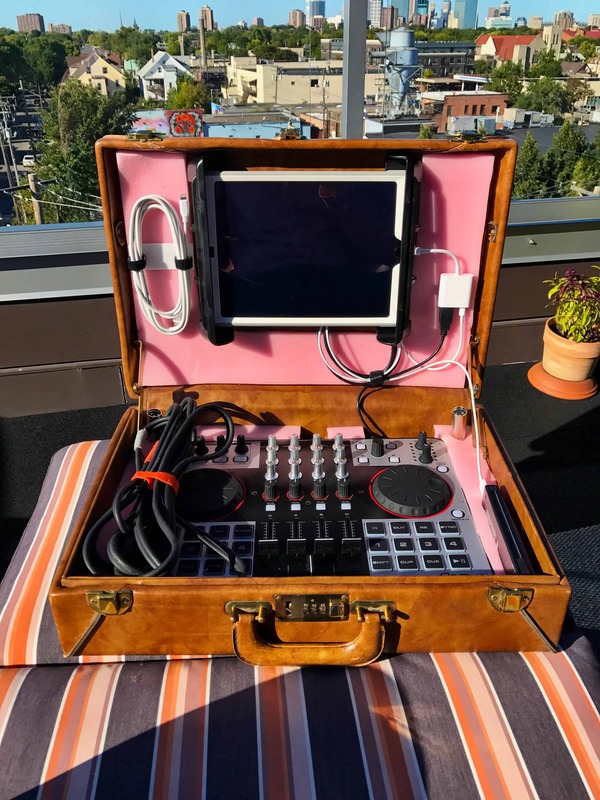 The hardware consists of a 2017 iPad 128GB, a DJ Tech 4Mix mixer, a USB portable battery pack, a USB cable, an iOS Lightening to USB 3 Camera Adapter, an iOS Lightening to USB cable and a 10′ RCA stereo cable. My goal was to be able to play 4 tracks simultaneously, not relying on any external power, making it hyper-efficient to plug into a sound system at the start of my set. I wanted my rig to also fit entirely in a carry on bag for when I travel to gigs. When I shifted from vinyl to digital in 2010, I was excited about the economical opportunity to expand to 4 turntables. My DJing evolved significantly, and I like to have at least 2 to 3 tracks playing at any one time in my mixes. This allows me to make new songs and soundscapes live by layering together pieces and parts of individual tracks. This creative aspect of moving beyond simply selecting tracks and playing them sequentially is what keeps DJing fun for me after doing it for 21 years. From 1999 to 2010 I was limited by the number of records I could bring to a gig when I traveled, usually around 40-60. With digital, I was only limited by the equipment I could bring. Sometimes this meant just a few USB portable drives to plug into equipment supplied by the venue I would be performing at. Usually, however, I would have to bring my laptop running Traktor and a mixer. 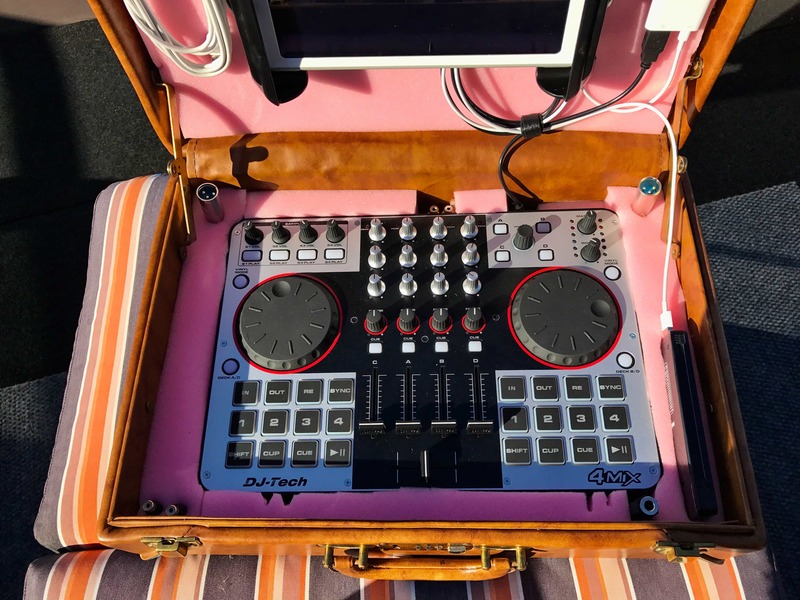 When I started DJing at Burning Man in the harsh desert environment, I didn’t want to bring my laptop or nice equipment as the dust from the playa gets into everything and is incredibly corrosive. Traktor has an iOS app that works on phones and iPads, but it only allows 2 tracks to be played at a time and external controllers are limited to Traktor only hardware. There were other apps like Algoriddim’s Djay that allowed 4-deck mixing, but I had difficulty transferring all of my music and cues from Traktor to the Djay platform. When I found the DJPP app and learned about how customizable it was, that changed everything. There was a robust community of developers and DJs that regularly communicate via Slack. One of the enthusiasts even made an application called TraCoConverter that could transfer all of my cue points from Traktor over to DJPP. This meant I could practice my performances using my laptop and Traktor, and then sync my songs and cues over to DJPP on the iPad. Further, because DJPP works with any class compliant mixer and that it can be fully MIDI programmed meant I could program my mixer to work the same with Traktor and DJPP, making the transition even easier. Another cool feature is that it works on iPhones, too. 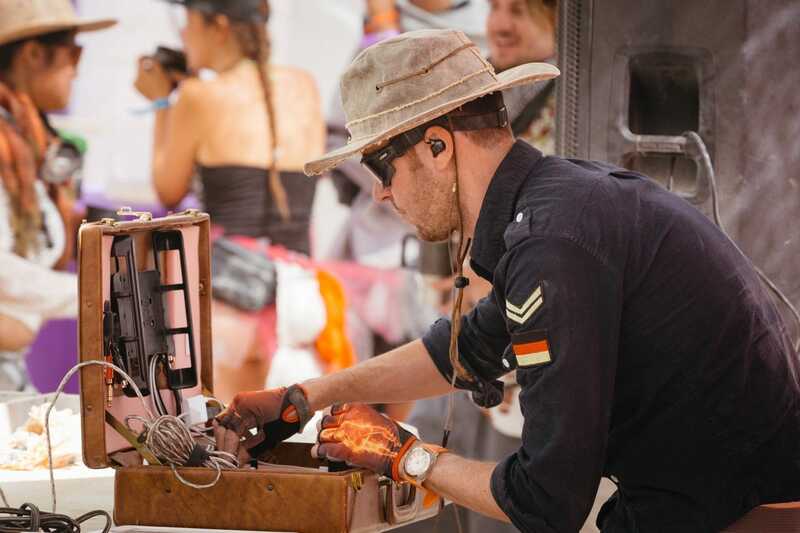 This was helpful at Burning Man 2018 when my iPad overheated in the desert sun. 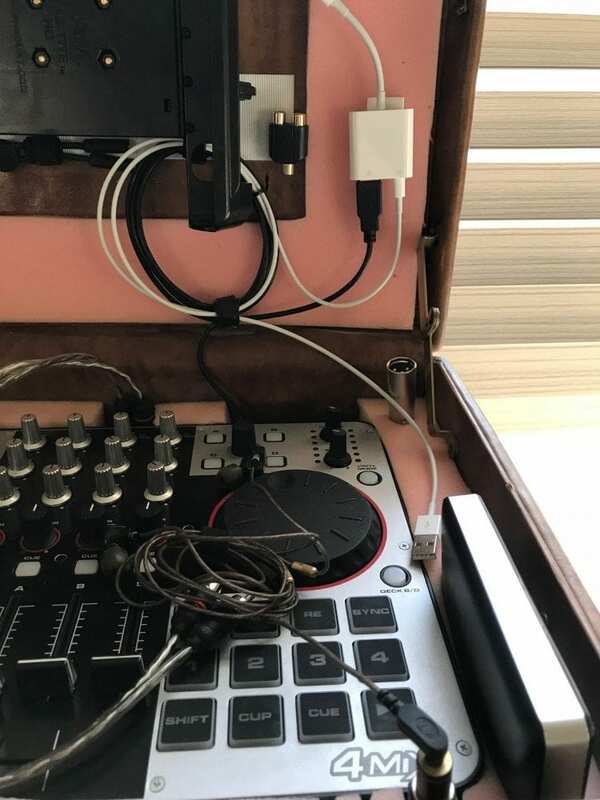 I was able to plug my phone into my briefcase and continue DJing 4 tracks at a time! After finding the DJPP app, I next had to find a mixer. Again, I wanted to be able to control 4 tracks simultaneously. I also wanted something that could be powered for 6-8 hours off of a portable battery pack. To date, the best solution I’ve found for this is the DJ Tech 4Mix. The biggest downside for this mixer for me is that the outputs are unbalanced RCAs rather than balanced 1/4′ or XLR outputs. This is a minor issue however and hasn’t had a noticeable impact on my mixing. Overall, I am beyond happy wth the DJPP app and my rig. I love how portable it is, and the looks I get when I set it down, open it up, plug in the audio cables and start mixing.